It was a nice, heartfelt story. Mia herself is a very honest character which everything really comes from her heart. But a lot of times during her flashbacks, Mia irritated me to no end, disappointingly. She was a bit whiny, insecure, and just plain annoying :-/ I do have respect for her though, because she was strong throughout all her difficulties and hardships, and she seems so have a lot of experience in that area. This book is about family and relationships, making gut decisions, and if course, love. During a drive with her family, things go awfully wrong and in an instant, she becomes an orphan. Dont worry, im not spoiling you. XD The car drive isnt the main storyline of the book :P So shes in the hospital all hooked to these wires and thingybobs on the brink of death, right? She has to make a decision. Does she want to stay, or does she want to let go? The things that were really a big let down was the writing. 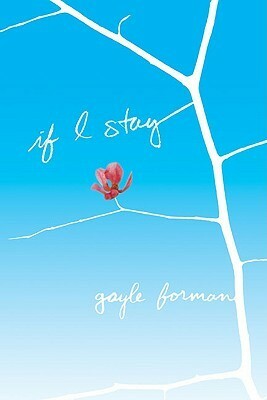 Ive gotta admit I aint a fan of Gayle Forman's writing... Its choppy, nondescriptive, and sad to say but....boring. Boring. Bah. and the whole Adam/Mia connecting with music thing was sweet! Music lovers and musicians unite! XD Adam was awesome. Him and Kim were the best people in here :D Kim grounded Mia, and I loved her for that XD Kim does not like boy crazed girls. Kim good. If you turn into one of those girlfriends, always ponying around after her boyfriend, and speaking in the first person plural. WE love the winter. WE think Velvet Underground is seminal. The ending was great! A lot of people were all like 'Waahh I sobbed my eyes outttt', but I wasnt at thata extreme level.. It WAS sad, but not to that degree. I think the ending was a marvelous wrap up, and it made the book a whole lotta better. If It wasnt for the ending, maybe it would be 1.5 stars? You get where Im goin, yeah? :P I did tear up though..if you were wondering..
And when he came off-stage afterward, he would be sweaty but it was such a clean sweat that part of me was tempted to lick the side of his face, like it was a lollipop. I didn't, though. Bottom line: Super short heartfelt read with badly written sentences and awkward dialouge with an annoying but respectful female protagonist who's going through a lot and makes her final choice in the end. Did I mention she also had.....erm...Interesting parents? O.o Theyre awesome, but a little stranngee XD Dude her mother swears so much *cracks up* and they both wore leather punk outfits for their wedding... Like I said, strange :P But its an interesting read. I wouldnt exactly recommend itt..but it isnt THAT bad xD So yeah! Cool!